Perhaps the most underwhelming of the rebooted X-Men prequels so far, this one does little to push the franchise forward apart from providing another weightless apocalyptic showdown for our mutant heroes to don the spandex. Oscar Isaac plays an ancient, all-powerful, god-like mutant called Apocalypse who is cryogenically frozen in ancient Egypt only to resurface in 1983 to form a new army and destroy the world. He plucks out young newbies like Psylocke (Olivia Munn), Angel (Ben Hardy) and Storm (Alexandra Shipp) – so we get to see their troublesome origin stories – and also Magneto (Michael Fassbender), who has been holed up in Poland with his young family living an idyllic life after his exploits in Days of Future Past. He quickly goes ballistic again when his wife and child are killed, helping Apocalypse to tap into Professor Xavier’s cerebral mainframe at his School for the Gifted and launch a load of nukes into the sky during a precarious global situation towards the end of the Cold War. This film mostly leaves geopolitical concerns out of the narrative (unlike the other retro-prequels), and instead focuses on introducing another generation of future X-Men regulars. 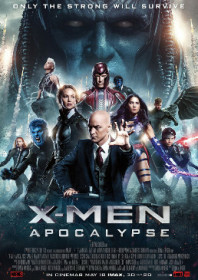 This includes a young Nightcrawler (Kodi Smit-McPhee), who is saved from a career as an east Berlin mutant cage fighter; Cyclops (Tye Sheridan), who is expelled from high school when his laser vision starts tearing holes in the walls; and Jean Grey (Sophie Turner), who faces social ostracism because of her incredibly powerful telepathy skills. Mystique (Jennifer Lawrence) is back, too. She has become something of an underground revolutionary icon and figurehead for mutant resistance since her proud exploits in the previous film. Her new heroic stance suggests similarities to her Katniss Everdeen role in The Hunger Games films, but this does very little to add depth to her character, and by the final act she is positioned as little more than a motivational device for Magneto’s better conscious. Rose Byrne’s CIA operative Moira is again completely perfunctory. Rather tellingly, the best sequence is a cameo from Wolverine (Hugh Jackman), who instantly adds energy to the film, and there are some quite funny moments involving Quicksilver (Evan Peters), particularly during a speedy rescue sequence as Professor X’s school is blown to smithereens. At nearly two and a half hours, it’s the longest of the X-Men films, despite having the least to say. There is a rather knowing line from one of the younger characters as they leave a screening of Return of the Jedi. “At least we can agree the third one is always the worst,” she says. This could either be read as a sly reference to X-Men: The Last Stand (the third film in the original series), or this movie (the third of the origins prequels). Either way, the statement seems appropriate.